When it comes to Dental Benefits, a one size plans do not fit all! A Patient-Centered Dental Benefits Plan that factors in the individual risk and needs of the person is better for both your employees and your organization! Oral health is very important to a person’s overall health. Scientific research continues to reveal how being free from dental disease is important for a person’s heart and circulatory system as well help avoid complications from diabetes. Dental Benefit Providers who incorporate PreViser’s tools into the benefit plan offerings help your insured maintain optimal oral health through education, risk and disease severity assessment, and evidence-based models of care. Plans that are “powered by PreViser” are based on a philosophy of patient-centered oral health and targets benefits to those who need them most. These tools are scientifically validated oral risk and disease severity assessments that helps identify those patients who can most benefit from preventive oral health measures. The first evidence-based, on-line risk-prediction system for periodontitis, caries and oral cancer. PreViser’s Self-Assessment fosters patient engagement and oral health education to members.This self-administered oral health risk assessment uses questions about oral health like brushing and flossing, frequency of dental visits, and other oral behaviors, then combines these answers with oral treatment history and the presence of chronic medical conditions and calculates a “my dental score” that reflects a person’s current oral disease status and the risk for future oral disease. Each person can print their report and take it to their next dental visit to begin a conversation with their dental professional about maintaining or improving their oral health. The patient report is educational to the reader and helps empower them to take action on their oral health. For larger employer groups, your Dental Benefit Provider can offer a corporate-wide version which allows the employer to collect aggregated de-identified data from the assessments and organize this data into analytic reports that explain the current oral health of the members. These reports can then help focus your wellness program on those areas that will have the greatest impact on improving health outcomes and reducing your claims cost. PreViser’s clinical tool, the Oral Health Information Suite or OHIS, allows the dentist to conduct the assessment that measures oral disease risk and severity for caries, periodontal disease and oral cancer. 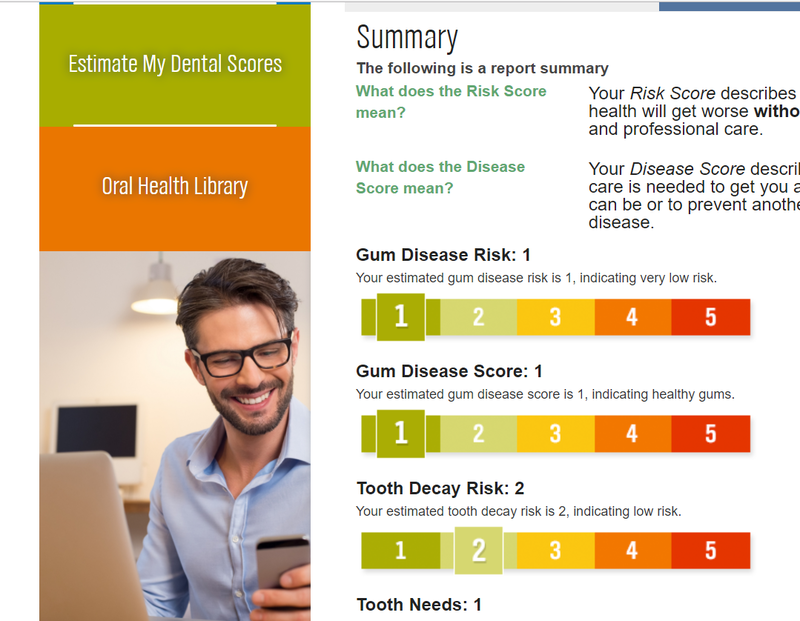 PreViser’s Oral Health Information Suite clinical tool scores the patient for risk and disease severity. 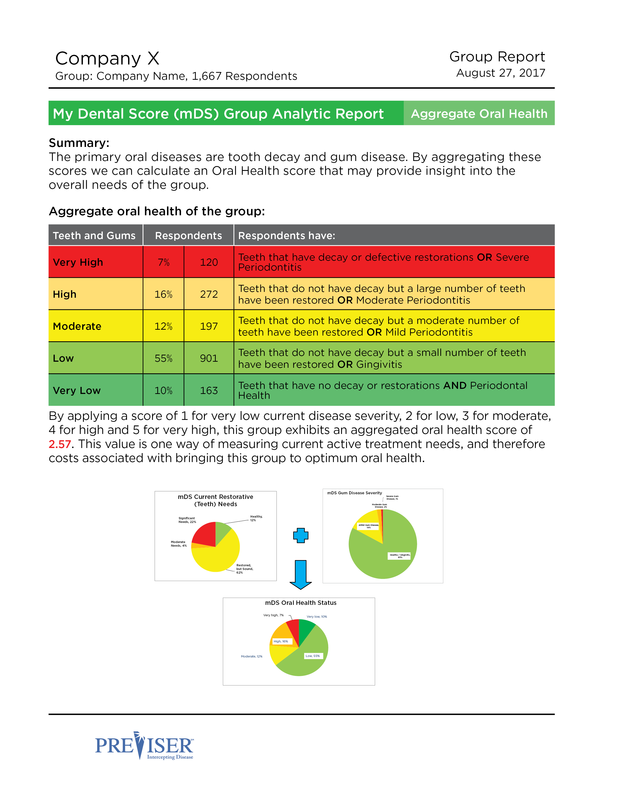 These scores can be used by Dental Benefit providers utilizing PreViser to offer their members additional preventive benefits if the scores indicate that a patient is at high risk. The OHIS also offers patients a detailed report that explains the current risk and disease state of the patient as well as offering information on how to improve the score and their oral health. Research indicates that the combination of the PreViser scores and the patient reports increase patient compliance to treatment recommendations, leading to improved oral health over time. With knowledge of a patient’s individual risk and disease score, the Dental Benefits provider can offer targeted messaging to help educate employees and their family members to impact their behaviors that can lead to higher productivity, lower risk of chronic medical conditions, improve oral health and reduce overall claim costs to the employer. Insightful analytic reports that your Dental Benefits Provider can offer your organization can demonstrate how the benefits you are providing your employees and their families are working to improve oral health over time. This offers additional insight than the analysis of claims alone. Plan designs that include PreViser offers the ability to identify outcomes. Improved health outcomes can save money for employers, create a more productive workforce, and foster healthier behaviors for your employees and their families. Ask your Dental Benefit’s Provider about including PreViser in your plan designs! PreViser risk scores add the “third dimension” to an understanding of patient needs, and differentiate between patients with the same current health/disease state, but who are at varying potentials that this state will deteriorate.